Beware: what I am about to post may trigger you. Those of you who are sensitive to mom (or dad) shaming... it is coming. I have seen a post on social media recently. The first time I thought was a fluke and I moved on. But now it seems to be gaining momentum and I am a bit taken aback. Do you see what is in there? 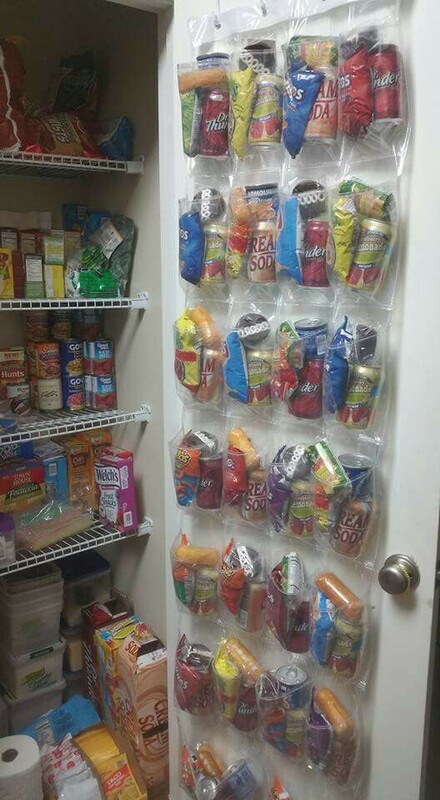 The hack includes advice to pre-make 30 or so lunches (minus the main coarse of a sandwich or something of that nature) using an over-the-door shoe rack. While I love the ingenuity of pre-making all those lunches, I am just surprised at the content. I live in my own bubble I guess, but in my bubble, people know the health risks of giving your children soda on a daily basis. Not to mention pairing that soda with other sugar-laden snacks. Before we get too far down this rabbit hole, please let me clarify that I have lived every Momma life you want to throw out there. I have been married and working full time. I have been married and stayed at home. I have been a single mother who worked part time. I have been a single mother who worked full time (and then some!). I know the challenges of working 60 hours a week and trying to prepare healthy food for my 3 children. I know the challenges of surviving in a household with one income and trying to prepare healthy food for my three children. I have done it all. But, in the end, I have always found a way to make it work. I am not really out to shame other parents. I truly think there must still be a lack of education. I don't think any parent wants to cause their children heart disease, Type 2 diabetes, asthma, high blood pressure, sleep apnea... and the list goes on... by provided them poor nutrition. I am just not sure how the big processed food corporations are winning and our nation is become more and more obese by the day. I do want to address the cost issue since that is one huge fallacy that really scares people. I do not know how or why people are kept under the assumption that eating better is so much more costly. Much of my youth was spent on government assistance and the vast majority of my food was home cooked because that was all my mother could afford. I distinctly remember that buying Oreos was such a fancy treat because my mother could bake 4 dozen cookies for the price of a small package of Oreos. We often had oatmeal for breakfast because the processed cold cereals were too expensive. 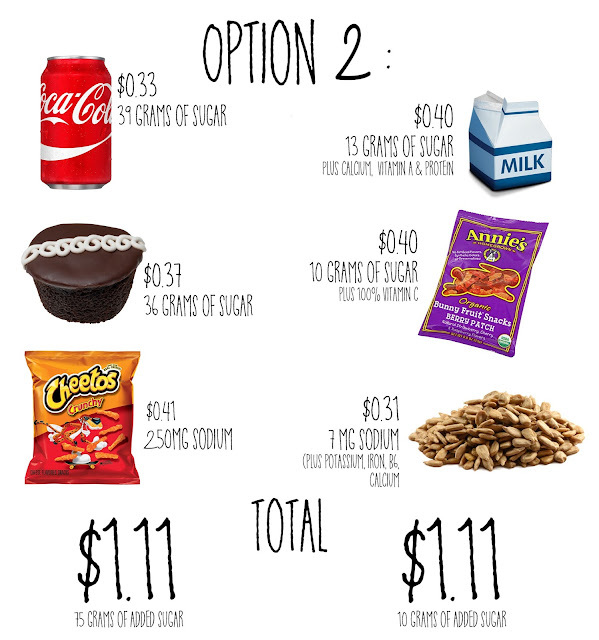 I decided to do a comparison of what the lunches above cost as compared to what I provide my children. I went online and got prices from Walmart as I think that is one of the least expensive places to buy your groceries and is available to a large portion of the US population. I am only comparing the snacks and drinks with the presumption we both give our kids a peanut butter sandwich for lunch. 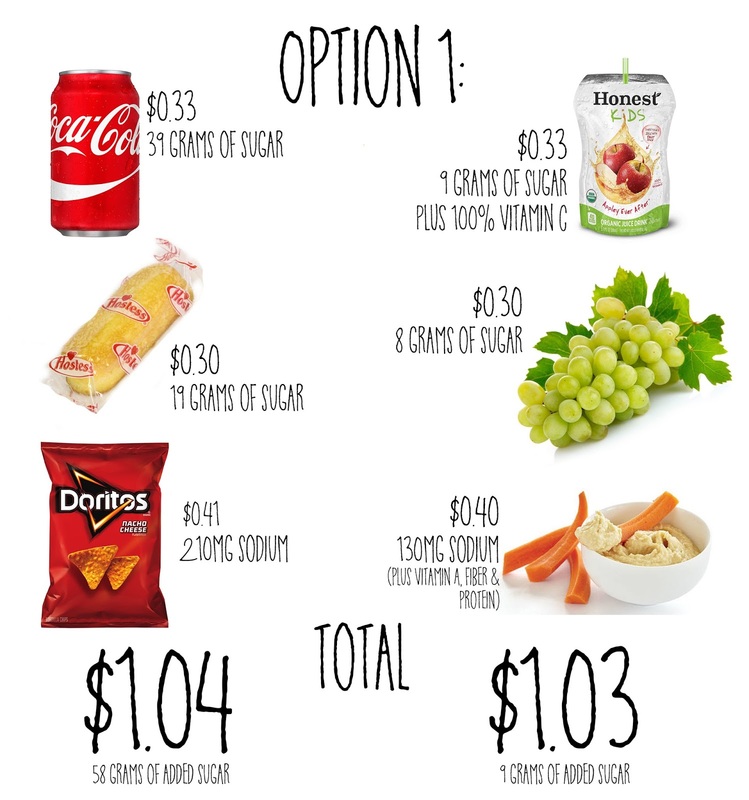 Almost exactly the same cost but wayyy less added sugar and way more nutrients provided. A child should have no more than 25 grams of added sugar PER DAY. This lunch on the left more than doubles that in ONE MEAL. It also provided barely any nutrients that a child needs to sustain themselves throughout their school day. Again, same price but this lunch on the left would provide THREE TIMES the recommended added sugar for one day! It is not about shaming, it is about education. How can we educate these parents? I was recently watching a show where a woman was trying to lose weight. It was so sad to hear her say that her life would have been so different if only her parents had taught her to have a healthy relationship with food from the beginning. She had 20 years of poor eating to try to reverse the effects of as well as retrain her brain to combat the addiction to processed foods. She had such an uphill battle ahead of her that would most likely last the rest of her life. Your child's life is worth it.